This year's International Mariachi and Charro Festival include an elaborate parade, dinners, outdoor concerts, music workshops and arts and crafts exhibits. Click HERE to see the full schedule of events. Puerto Vallarta, Jalisco, Mexico - One of the most important cultural events of the year in Guadalajara, the birthplace of Mexico's Mariachi and Charro traditions, is the International Mariachi and Charro Festival. In 2018, the festival celebrates 25 years with festivities taking place at various venues in and around the city from August 20 to September 2. The spirit of Guadalajara's rich culture runs hot in the veins of its Mariachis, the musical icons who serenade the nation's boulevards, public squares, and sidewalks with a brand and style of music that is both unique and legendary. Like the Charros (Mexican Cowboys), the Mariachi is a symbol of nationalism and culture in Mexico, tracing its origins to the Guadalajara region. Combining indigenous influences with more modern instruments introduced by the Spanish, Mariachi emerged in the western state of Jalisco and first became popular nationally in the early 20th century. The distinctive sound has since taken root in the United States and across the world as the most instantly recognizable aspect of Mexican culture. 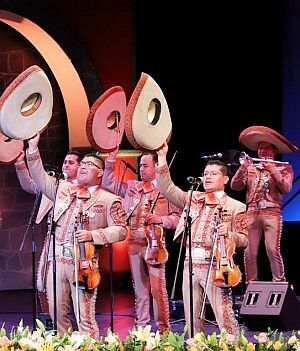 Since 1994, some of Mexico's best Mariachis have come to Guadalajara to demonstrate and celebrate this popular style of Mexican music. In addition to Mexico's musicians, Mariachi bands from other countries - such as Argentina, Aruba, Australia, Belgium, Canada, Cuba, Chile, Colombia, Costa Rica, Ecuador, France, Panama, Slovakia, and Venezuela - travel to Guadalajara each year to perform at various concert halls and street markets throughout the city. Festival-goers will also enjoy the flavor, color, tradition and culture of Mexico at the Cultural Pavilion at the Plaza de la Liberación, which will offer more than 70 folkloric dance and music performances, music workshops, arts and crafts exhibits and other activities and events for 9 days. The festival's highlight is always the Mariachi Parade that runs through the city's center, scheduled this year for Sunday, August 26 from 10 am to 1 pm. Every year, groups of Mariachi musicians from all over the world take part, playing atop creatively designed floats, while machines blast endless streams of confetti and colored smoke into the air to the delight of Mariachi enthusiasts. But wait, there's more! As Charrería continues to be a bond between our traditions and culture that has always drawn worldwide attention, the 25th International Mariachi and Charrería Festival will also feature the 19th Annual National Charro Championships at the Lienzo Charro "El Triangulo de Los Arenas," located in the Municipality of Tlaquepaque, August 23rd through 26th. Year after year, some of the best Charro teams in Mexico gather in Guadalajara in hopes of winning the trophy and being named champion of this prestigious competition. Charros are Mexican icons, displaying a style and macho bravery romanticized in the nation's folk songs, paintings and movies. 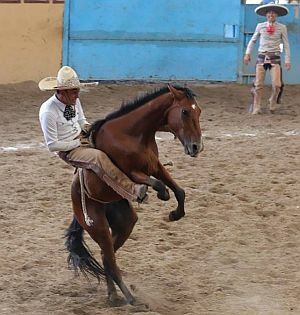 Their life-risking antics - jumping through the air onto wild mares, riding bucking broncos, and bringing down rampaging bulls with lassos - is called Charreria, and considered rural Mexico's official sport. The Charrería tradition gives both Mexicans and those of Mexican descent, a source of pride. The centuries-old practice brings together working skills, training and discipline, horsemanship, music and dance, and symbolic reenactment of Mexican values and customs. In short, it is a celebration of what it means to be Mexican. Annual events such as the International Mariachi and Charro Festival dazzle the young and old, rich and poor, nationals and tourists alike - so don't miss your chance to enjoy two of Mexico's most beloved traditions in Guadalajara from August 20 through September 2. Travel to Guadalajara is easily accessible via the Miguel Hidalgo International Airport (GDL), which is located 24 miles from the city center of Guadalajara, with non-stop daily flights from major markets across the United States and Canada.